Want to get inside the minds of potential customers for your local business? Columnist Sherry Bonelli shares insights from BrightLocal's annual Local Consumer Review Survey. A business’s online reputation is more important than ever. In fact, a company’s online reputation is fast becoming one of their most valuable assets — if managed properly. Why? In a world where online reviews show up virtually every time a person searches for a local business, potential customers can’t help but be confronted with reviews about a local business’s products or services — the good, the bad and (sometimes) the downright ugly. So what impact do these reviews have on people searching for a place to spend their money? Every year, BrightLocal (disclosure: my employer) surveys everyday consumers to gauge the sentiment and attitudes they have about the local companies they do business with. The purpose of the survey? To help small to medium-sized businesses (SMBs), digital marketing agencies and SEOs understand how online reviews influence the purchasing decisions consumers make as they search for local companies, products or services. If you (or your clients) have been avoiding the topic of online reviews up until now, I have a feeling you will change your mind after you learn more about how consumers read and act (or don’t act) after evaluating online reviews about businesses. The Local Consumer Review Survey is in its sixth year. Over the past several years, there has been a noticeable shift in how consumers search online for local businesses and the importance online reviews play in a consumer’s purchasing process. This year BrightLocal surveyed a US consumer panel made up of 1,000 individuals. The survey questions explore how consumers read and use the reviews they see online. The answers show how businesses and marketers can qualify the value consumers put on online reviews and whether these reviews have any impact on a consumer’s purchasing decisions. More and more these days, consumers are using the internet to find local businesses and see online reviews almost every time they go online to do a local search. Why the increase? Over the past few years, many local businesses have realized the importance of optimizing their online presence for the local market by claiming their Google My Business or Bing Places for Business pages, creating location-specific pages on their website, adding Google Maps to their site and other local SEO strategies. Additionally, Google shows online reviews in many search engine results pages (SERPs), and they even recently started adding third-party review sites and reviews to a business’s Knowledge Panel. Also, because people have access to a variety of devices to perform searches on, such as smartphones and tablets, it’s easy for them to jump online wherever they are and search for reviews about a business, product or service. So, how do consumers read and use the information found in reviews? Let’s find out by looking at some of the survey questions and answers. Which of these business types have you read online reviews for? Note: Respondents were told to select as many answers as needed. The most commonly read reviews by consumers are Restaurant/Cafe reviews, with 60 percent of respondents having read reviews for businesses in this category. Hotels/Bed & Breakfasts reviews came in second, with 40 percent of respondents seeking reviews for businesses in this category. Also popular are Medical/Healthcare Professionals, Clothing Shops, Hair/Beauty Salons, Automotive Services and Grocery Stores. Restaurants/Cafes, Hotels/Bed & Breakfasts, Medical/Healthcare Professionals, Clothing Stores, Hair/Beauty Salons, Grocery Stores and Automotive Services are the main businesses that people want to read reviews for. One thing to consider is that these numbers are somewhat dependent on both the type of business and how frequently consumers tend to use that type of business. For instance, business types that people use frequently (like restaurants or grocery stores) will probably have more reviews because more people simply visit these types of businesses more often and on a regular basis. You will probably find fewer reviews for locksmiths, accountants or pest control companies because these services are not needed as often. Even though reviews for some business types are read less often, when one needs those businesses (e.g., you lock yourself out of your house or you see cockroaches in your kitchen), then consumers will actively look at those reviews. 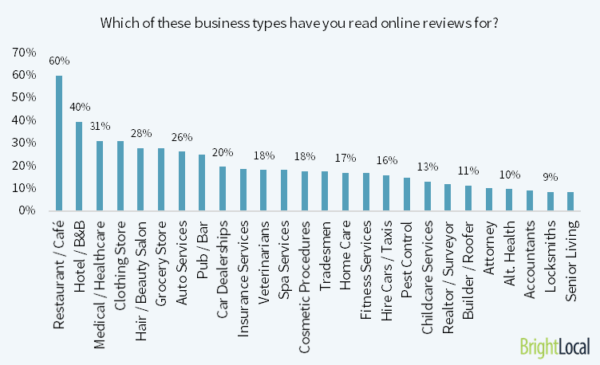 Bottom line: every business benefits from having online reviews (no matter the industry). How many online reviews do you read before you feel you can trust a business? 90 percent of consumers read just 10 reviews or fewer before they feel that they can trust a business (vs. 87 percent in 2015). 32 percent of consumers form an opinion by reading one to three reviews. 68 percent of consumers form an opinion by reading one to six reviews. Consumers form opinions about a business fast, with 68 percent forming an opinion by reading just one to six reviews. Almost nine out of 10 consumers determine whether they can trust a business after reading 10 or fewer online reviews. To remain relevant, businesses must have a reputation strategy where they monitor what consumers are saying about them and have a way to proactively get positive new reviews from happy customers. Why? When evaluating a business, consumers will typically look at the top reviews first. If the recent reviews are negative ones, they may not read past those bad reviews — even if there are positive reviews right below the negative ones. It’s imperative that businesses generate ongoing positive reviews so that any negative reviews they have are pushed down on the list. Business owners shouldn’t be scared of online reviews, they should see them as an opportunity to engage with their customers and get feedback about their business. How many different review sites (e.g., Yelp, TripAdvisor) do you look at before you make a decision about a business? 20 percent of consumers look at one review site before deciding. 59 percent of consumers look at two to three review sites before making a decision. 21 percent of consumers look at four or more review sites before deciding. This new question focuses specifically on how many review sites people go to before they decide about a business. The answers vary depending on the type of business someone is researching. For instance, if they’re looking for a restaurant, they might only check one or two review sites. But if they are going to purchase a new car and the financial stakes are higher, they will probably look at more review sites. When judging a local business on its reviews, which of these factors do you pay most attention to? Note: Respondents were told to select a maximum of two answers. 58 percent of consumers put the highest weight on the overall star rating. The recency of reviews is also important, coming in third at 41 percent. When evaluating online reviews, the most important factor to consumers is how many stars a business has. Star ratings are a very quick and visual guide to show how trustworthy a business is. But there are other factors that people consider to get a holistic view of a business’s reputation. Other factors are the sentiment of reviews (i.e., positive or negative comments and statements) and the recency (aka age) of reviews. As an example, if a business has three five-star reviews, but the reviews are two years old, the consumer will probably devalue the importance of the star rating because they really want to see more recent reviews. When selecting a local business to use, what is the minimum star rating a business must have for you to use them? 87 percent of people want to see three- to five-star reviews about a business before they will consider using them. Of the consumers surveyed, only 14 percent would consider using a business with a one- or two-star rating. For consumers, star ratings are considered the most important factor in deciding which local business to use. For instance, 56 percent of consumers won’t consider using a business with just one to three stars; in other words, if a business has less than a four-star rating, that company is losing out on 56 percent of potential customers. Notably, while consumers consider star ratings to be an important decision-making factor, they are also realistic — only 8 percent expect a business to have a five-star rating before they will consider using them. Note: Respondents could select more than one answer, so these numbers cannot be directly compared to 2015 results. 68 percent of people say positive customer reviews make them more likely to use a local business. 12 percent of consumers say that they read reviews, but those reviews don’t influence their decision on which local business to use. 42 percent say that negative reviews make them not want to use a local business. Almost 70 percent of consumers said that positive reviews make them more likely to use a local business. Additionally, 42 percent of consumers say that negative reviews make them not want to use a business. These numbers show that people seriously consider reviews when making a purchasing decision. 83 percent of people trust online reviews as much as a personal recommendation — if they meet their requirements (vs. 80 percent in 2015). Just 16 percent of consumers surveyed said that they don’t trust online reviews (vs. 20 percent in 2015). Authenticity is essential — over a quarter of consumers trust reviews more than personal recommendations only if they believe the review to be genuine. People trust reviews now more than ever, but a portion of consumers are concerned about fake reviews: 27 percent of people will trust reviews if they think they are authentic (31 percent in 2015). If consumers think that a review is “planted” or “seems too good to be true,” they will take that into consideration. Fake reviews, and the effect they have on eroding consumer trust, have become hot topics as of late. As this topic gets more media coverage, consumers become more aware of the pitfalls of online reviews. When you read positive reviews for a business, what is the typical next step you take? After reading positive reviews, 54 percent of consumers will visit the business’s website (48 percent in 2015). 19 percent will visit the business directly. 17 percent will search for additional reviews about the business. The most common next step for consumers who read reviews is to visit the business’s website (54 percent). This is an easy next step because people are already online, and there’s typically a link to the business’s website from the review sites. This does reinforce the need for SMBs to have a mobile-friendly website. Only 19 percent say their next step would be to visit a business’s premises. This will vary depending on the type of business a consumer is looking for. For instance, if they’re looking for a restaurant, the numbers will be higher; if they’re searching for a physician or wedding planner — something that might first require an appointment or phone consultation — then it’s unlikely that your next step would be to visit the business. A full 17 percent of consumers say that they would seek out additional reviews about the business they are considering. This indicates a high level of interest in a particular business — if a consumer is continuing to look for reviews, then that means they are probably getting closer to a buying decision. Have you ever been asked by a business to leave an online review for them? 70 percent of consumers have been asked by a business to leave a review. 50 percent of consumers have been asked to leave a review about a business and actually left a review. This is important: if asked, approximately 71 percent of consumers will leave a review for a business. This reinforces the need for every business to have a reputation marketing strategy. While this finding does illustrate the importance of asking customers for reviews, businesses must exercise caution and patience in doing so. Why? Too many reviews acquired within a short time frame can look suspicious, meaning those reviews could end up getting flagged and filtered out on the review platform. Ask your customers for reviews gradually over time, and don’t overdo it. Additionally, businesses should never use offers to incentivize consumers to leave reviews (That’s considered unethical). Reviews, positive or negative, serve as a useful feedback tool for businesses. Use this information to improve your customer service or business offerings. Do you want to see even more questions and answers, as well as a deeper analysis of the results of this year’s survey? Check out the full 2016 Local Consumer Review Survey.